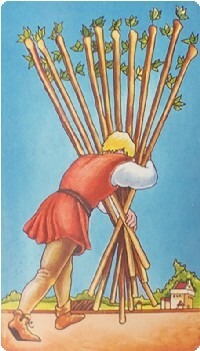 The Ten of Wands shows a man carrying a very heavy bundle of wands or sticks. He appears to be over-burdened with the weight, yet he knows he is not far away from the town he is walking towards. This card appears to indicate someone who has just finished a harvest and is struggling to bring the fruits of his labours to the local market. The Tens in Tarot represent the completion of a cycle, and thus with the Ten of Wands, you have reached the end of a cycle after a period of struggle. 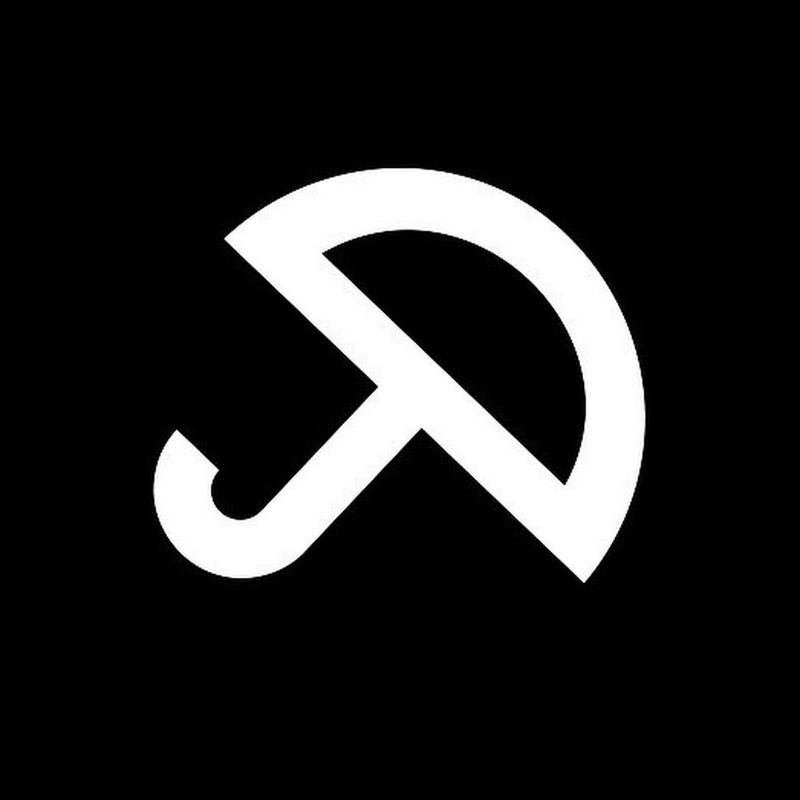 You are finally reaping your rewards after investing a lot of hard work and effort. You have fulfilled a creative venture, realised a dream or accomplished a major goal, and now must deal with the consequences of that fulfilment. However, the Ten of Wands suggests that even with the achievement of your goal, there comes with it great responsibilities and commitments. While you have reached a point of completion, you are becoming starkly aware that you must now carry on with the responsibilities you have laid out for yourself, in order to ensure ongoing success. The trouble is, however, that these responsibilities may become too much to bear and you are struggling to let go. It is a bit like the business owner who creates a flourishing business but who is unprepared to delegate some of his/her responsibilities to the staff, and ends up working 70-80 hours a week. The inspiration and creativity that was associated with the initial goal or vision rapidly disappears, and everything becomes hard work all too quickly. Thus, it is incredibly important to let go of or delegate some of your responsibilities in order to free you up to still enjoy life. The Ten of Wands serves as a reminder of how much we take on in our lives and all the extra burdens and responsibilities we weigh ourselves down with. We take on so much, trying to do all the things that need to be done. Thus, this card asks you to stop and examine your current lifestyle or work. Assess which activities or tasks are really urgent or really important, particularly in relation to your broader goals. You may need to employ various time management or prioritisation methods in order to determine where best to spend your time and which tasks you can drop. Your goal needs to be greater efficiency, whilst also freeing yourself up for rest and relaxation when you need it. This card can also mean that you are being oppressed by outside sources. You are over-worked, over-tired and over-stimulated. You have more on your plate than you can possibly handle and you have taken on too much at this point in time. In an effort to get to the finish line, you have found yourself overwhelmed with the extra responsibility and activity. You need to stop working so hard. If you cannot stop, then conserve your energy and pace yourself. When you are over-committed everything becomes a strain. Upright, the Ten of Wands reflects that you have taken on a heavy burden. Reversed, the Ten of Wands indicates that you are unnecessarily holding on to this burden when you do not need to. If you are feeling weighed down by your present circumstances, look at different ways you can lighten the load. Can you delegate certain tasks and responsibilities? Are you worrying about matters that do not concern you or cannot be changed? Do not become a martyr and take on more than you can realistically handle. If you are going through a challenging time, then the Ten of Wands reversed indicates that this time will soon pass and you will feel less of a burden weighing on your shoulders. You may be actively identifying those activities that do not bring you any value in your life and you are starting to release yourself from these unnecessary responsibilities. You may even be going through a purging process, clearing out old clothes and selling old furniture, in order to de-clutter and simplify your life. You will benefit from better organisation and prioritisation at this time. Sometimes, the reversed Ten of Wands indicates that you are avoiding responsibility and making it even more difficult for others who must take on your share. Thus, the saying, “You have made your bed, now lie in it,” is very appropriate for this card.